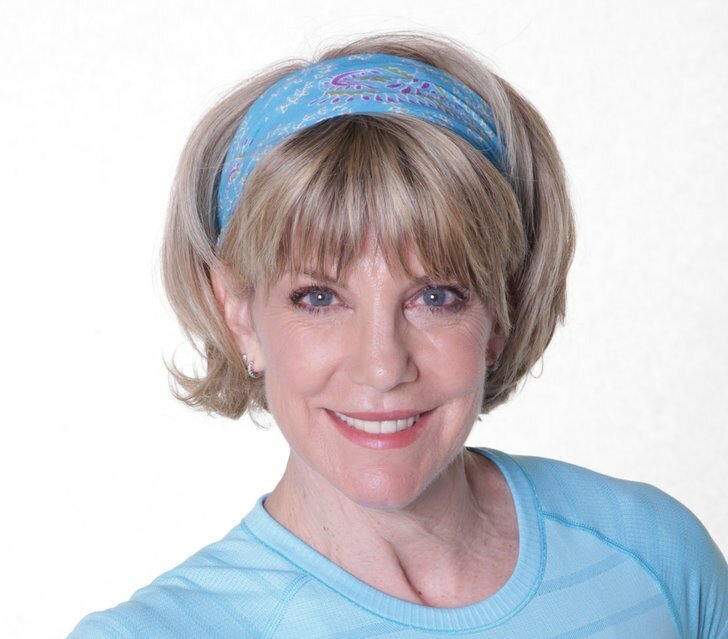 Keli Roberts, is perhaps most recognizable as the “Trainer to the Stars” having trained Cher, Kirstie Alley, Jennifer Grey, Jennifer Jason Leigh, Russell Crow and Faye Dunaway to name a few. She also released a super successful Step video with Cher. Keli began training people back in 1987 after a successful career as a model and actress, working in Australia, her native country, and Europe. Having appeared in the films Running on Empty and Knock Outs, she found her true calling in the Fitness World. She has also released 2 books, Stronger Legs and Lower Body and Fitness Hollywood. When did your athletic career Begin? I started swimming competitively when I was 6 years old and then I swam, high jumped, ran track, played netball and tennis and was captain of the synchronized swimming team in high school. When I left school and started to work as a model, I did nothing competitive till I got fit again in the 80’s. Although there was a brief time that I got heavily involved in yoga and even taught it for a while, it wasn’t till I gave up modeling that I got really fit and healthy. What adversity have you had to overcome as an athlete? Anorexia and bulimia was a huge adversity, and falling in love with cycling outdoors is what ended up helping me heal. I found I had to eat if I wanted to ride, and I couldn’t ride if I’d thrown up, I loved cycling so much that I was willing to do anything to ride. The other obstacles have been injuries. I got hit by a car on my bike and severely damaged my left shoulder, that I unfortunately fell on two more times, crashing. By 2014, after two surgeries I had no choice but to get it replaced. It was a long recovery. For my physical therapy I went to the therapy pool at the Rose Bowl Aquatics center and fell in love with the water again. As a result, I now regularly swim laps! My shoulder is doing incredibly well, I have full function and no pain, it’s wonderful. I have had other injuries over the years, several broken ribs, a broken clavicle and always had to have time off training to heal. Those have been some of the richest times in terms of growth. I discovered hiking, water exercise, gardening, knitting and the value of rest and recovery! I also have a rare autoimmune disease, polymyositis, which is an inflammatory disease of the muscles. It makes me feel extremely tired and gives me severe muscle pain. When it’s bad, the only thing that makes me feel better is being in the pool. It makes my job really hard! Sometimes when I have to get up in front of a class to teach, all I want to do is curl up, cry and go to sleep. But I don’t have that choice. Bob Marley said “You don’t know how strong you are till strong is the only choice you have”. I live by those words. Possibly the greatest obstacle has been having bipolar disorder. When I’m in a low ebb the last thing I feel like doing is working out. This is where knowing how good it makes me feel makes all the difference. When I don’t want to work out because I’m depressed, it’s all the more reason to, it lifts my mood more than any medication can. I’m on medication and under the care of a good therapist, so I believe in taking all the roads to recovery, but exercise is medicine, for me it’s the best anti-depressant there is! How has working out impacted your life? I had about 20 years of severe depression and anxiety before I was diagnosed with bipolar. During that time I depended on exercise, I had to or I wouldn’t have gotten out of bed in the morning. It was an addiction. Now that I’m on the right balance of medication, for the most part I don’t have the crazy highs and lows. It’s like my moods now have closer end ranges. Working out now is about much more than looking good. For me it’s about feeling good. Looking good is a nice side effect! How often do you train per week and for how long? I teach several classes per week, strength training workouts, rowing, cycling and Barre, and on top of that I swim a mile 2-3 times per week, and I ride twice a week, between 30-50+ miles per ride. I sometimes run on a treadmill if I need a quick cardio fix, if I can’t get to the pool. No matter how much you don’t feel like working out, just get started, just do the warm up. Once you’re there, once you start you’ll be fine. I do this myself whenever I’m lacking motivation, I just say to myself, “just do the warm up” and then I get started and I’m fine. No matter what, you’ll ALWAYS feel better when you’re done. It’s important to remember that. How has the world of fitness changed since you first began training people? I started training people in 1987 and boy has it changed! But it’s funny, in some respects it hasn’t changed at all. Take this high intensity interval training trend. This is not a new technique, research has been done on it for decades, and yet people act as if it’s something completely new. We have far more equipment available and science to back it up, and that’s a really good thing. Professional education is now accessible and there are several excellent certifications available for group fitness instructors and personal trainers. ACSM, ACE, NSCA, NASM all have excellent courses for people wanting to learn. In the 80’s the weight room was heavily influenced by body builders, now with all the movement towards functional training and the types of equipment for that, training techniques have also evolved. What has been your most successful video or program? Cher Fitness, A New Attitude was my first and of course with Cher in it, it sold millions of copies, then my Step videos after that were incredibly successful. I think since then my 10 Minute Solution Kickbox Boot Camp has been huge, people love it because it’s 5 x 10 minutes of complete kickboxing focused strength and conditioning. It’s a super fun one! I’m in the process now of developing some new DVDs that I’ll be filming early next year specifically for perimenopausal, menopausal and post-menopausal woman. It’s something I feel super passionate about since I don’t feel this person is catered for and she has such specific needs, plus I know her well…I am her! What do you feel is your greatest accomplishment in the world of fitness? This is a hard question, I’ve won a lot of incredible awards, amongst them the Empower! Inspiration Award, the IDEA Fitness Instructor of the Year and I’ve been inducted into the Fitness Hall of Fame, but early on, when I first started teaching a young man who weighed over 500lbs started coming to my classes. I gave him lots of encouragement, took good care of him and he started losing weight. He stuck with it and after a good period of time lost all his weight. He came up to me one day with a before and after picture and told me this was because of me. We both cried. It was singularly one of the most influential moments in my life, because it was the moment I decided to pursue full-time fitness. Over the years I’ve had many other great accomplishments and success with my PT clients, as a fitness professional we have the incredible ability to make a difference in people’s lives. This is the reason I do what I do. What changes do you feel people need to make in terms of their fitness, as they get older? You have to learn to listen to your body. I’m constantly surprised what my older clients can do if they don’t limit themselves mentally. A male client of mine recently turned 70 and his goal was to be able to do three sets of chin-ups. He not only made his goal but exceeded it and also bench pressed and dead lifted much more than he thought he could. But to be able to push your body as you age, you have to learn to recover, rest and allow your body to regenerate. Sleep is critical as is good nutrition. Eating good balanced meals is not optional! It’s a must. Starting gradually and building gradually if you’re not already working out can make all the difference. You really have to build your strength and endurance gradually. No matter how small it is you start out with, it’s enough. Build a tiny habit and stick with it. Flexibility and stretching are also a big part of that formula. Not only do you lose strength and aerobic capacity as you age, you also lose mobility. Having good flexibility can make a big difference to your posture. Quite a bit of what you describe I have experienced. Sometimes it’s just getting one foot out of bed and on the floor. Cycling enhances my life every day. You keep going! You are a true inspiration to everyone who meets and talks with you. You are serving and helping others every day, keep on going. Thanks for sharing your experience. Great message. I’ve followed you for years and you have been such an inspiration. I have Multiple Sclerosis and struggle with fatigue and mood swings. Being active helps more than any drug, I agree! Keep going. Thanks for sharing! Christy – Thanks for the note. Agreed!